Last Saturday night featured the rise of a young star and the fall of a comet that was soaring. 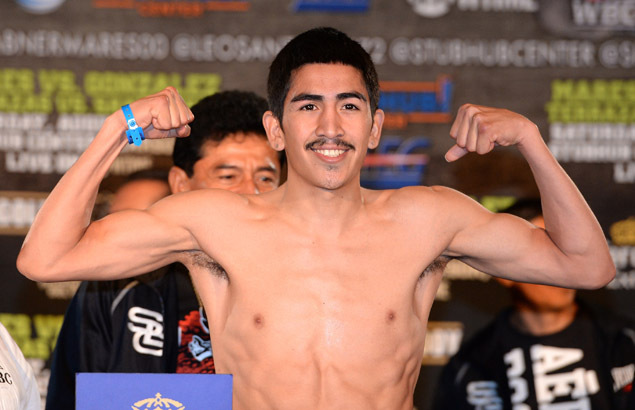 Leo Santa Cruz (25-0-1 15KO) added a second title to his resume by stopping the WBC junior featherweight titleholder Victor Terrazas (37-3-1 21KO) in the third round. The two pugilists stayed on the inside and traded savage punches but Santa Cruz proved he was the bigger puncher. Terrazas was getting pummeled and his swollen face showed it. The end would come in the third round when Terrazas absorbed a vicious left hook that dropped him. He rose and tried to continue but Santa Cruz kept the pressure on and put the former champion down with a combination that ended to the body of Terrazas. Although he managed to rise again, the referee had seen enough and waved the fight off. What is impressive about this victory for Santa Cruz is how quickly he was able to take out Terrazas. Many expected the Guadalajara native to push Santa Cruz to his limits and take him deep into the fight but the young two division titleholder made short work of him. There was talk of Santa Cruz fighting Abner Mares at featherweight but that plan is on hiatus for more reasons than the obvious. Santa Cruz has stated that he would like to stay in the junior featherweight division for a few more fights in order to prove his dominance. Such a thing will be difficult to do with monsters such as Nonito Donaire and Guillermo Rigondeaux in the same division but this author hopes Santa Cruz does challenge himself and seek out the best opposition possible. The obvious reason the Abner Mares vs. Leo Santa Cruz matchup can be made is due to a man by the name of Jhonny Gonzalez (55-8 47KO) and his devastating left hook. Mares (26-1-1 13KO) was as high as a seven to one favorite going into this fight and was coming off impressive victories against the likes of Daniel Ponce De Leon, Anselmo Moreno, and Joseph Agbeko. Gonzalez was meant to be a challenging but flawed opponent who could give Mares an entertaining but winnable first defense of his featherweight title. If Jhonny Gonzalez got that message, he must have punched it. The fight started with both men being conservative on their attack. 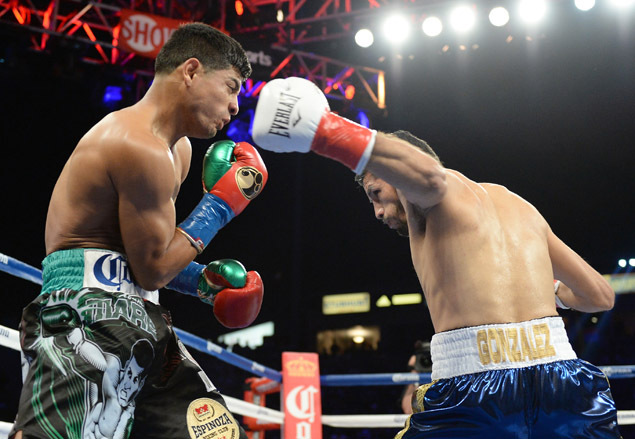 Both men showed excellent movement and technique but it seemed that Mares was more focused on his offense than Gonzalez was. However, Gonzalez was simply waiting for the opening he wanted. He saw his chance towards the end of the first round and struck Mares with a powerful, compact left hook to the jaw of the champion and put him flat on his back. Mares rose and valiantly tried to fight back but it would have been wise to clinch or back away. Instead, Gonzalez stayed on his opponent and finished him off with a series of blows that put Mares down for the second time. The referee had seen enough at that point and waved the fight off. This is the theatre of the unexpected.